Announcement Hi and welcome to my little shop! 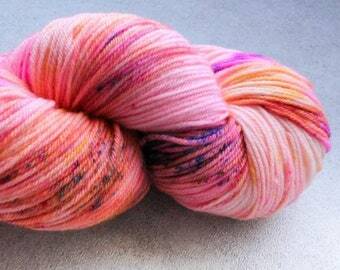 I dye one colorway a day, which means every day there is new fiber! Come back for more goodies. 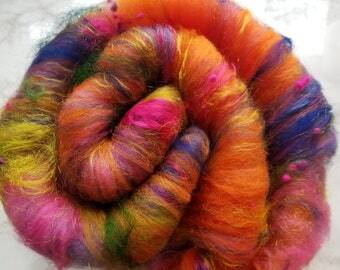 Find me at Instagram @spinningmermaid for fiber eye candy! Hi and welcome to my little shop! 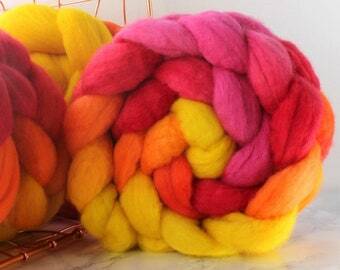 I dye one colorway a day, which means every day there is new fiber! Come back for more goodies. This yarn is ultra soft and squooshy! In person you can see a lot more colors, like golden overtones on some areas, and fuchsia areas around the purple speckles. It’s really gorgeous and has a great feel! Can’t wait to knit it up and try it on! 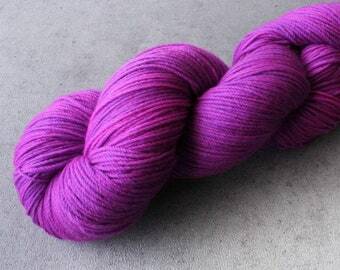 I’ve never seen such a bright purple yarn! 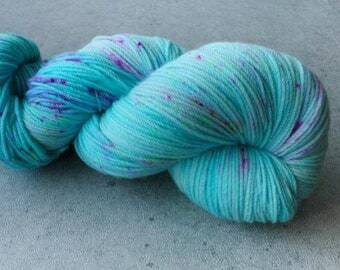 I love how well it matches the other yarns from this shop. It’s a really gorgeous tonal—not quite as soft but definitely as squooshy as the So Charming pink. This is begging to be part of a Casapinka design, one of my favorite designers! 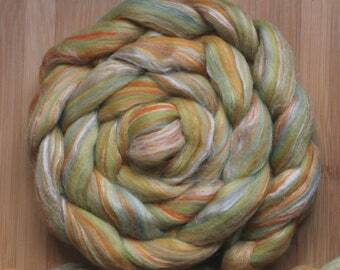 This yarn has so many colors in it, but when you pair it with others it looks very harmonious. It’s every bit as soft and squooshy as the So Charming pink! I think it would probably brighten or tone down a lot based on what it’s put with but it definitely doesn’t look as chaotic when it’s paired. This batt reminds me of Unicorn Pusheen for some reason. I wouldn’t have ever thought to mix some of these colors, but I think they’re amazing together! 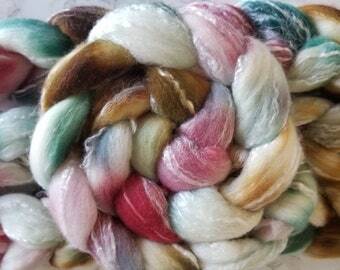 Spinning Mermaid Fibers has done it again! 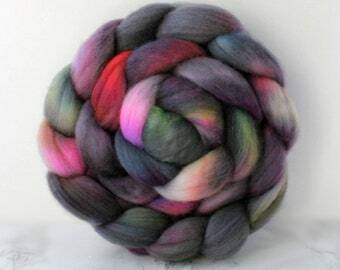 I’m really looking forward to spinning this and I can’t wait to see what comes up in the shop later! This is a gorgeous tonal blue with surprisingly high saturation for a lighter blue, and the purple speckles match the bright orchid perfectly, as you can see. It’s super squooshy and soft but not as soft as So Charming or Candy Beach. The blue is so saturated that if I aim my iPhone 8+ camera directly at it, the picture turned orange! You really need to get these and see them in person; they’re amazing. When I saw this braid, I HAD to have it! It looks like candy! This photo was taken with my iPhone 8+ in my regular bedroom lighting inside the Etsy app. 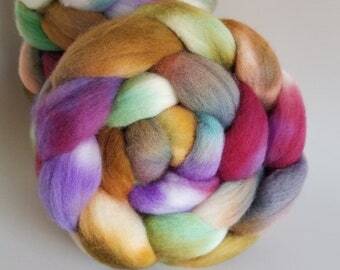 Spinning Mermaid Fibers’ colors are legit! 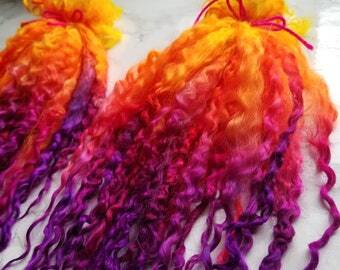 I got this braid to go with another from Spinning Mermaid, but when I actually look at it up close I’m amazed by how many colors it has in it! From a distance both braids match and they still do in person, but up close they have so many different colors! It’s so cool! I definitely want more from this shop. I’m pretty sure I’m addicted. 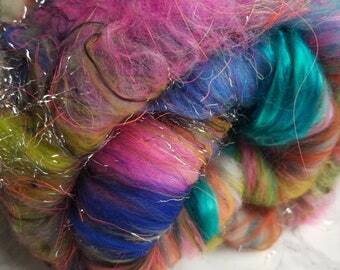 This batt is just as gorgeous and bright in person as the pictures showed! It feels like brain candy! I just want to dissolve into inarticulate squeeing. It’s that kind of batt. Also, to buy more. A lot more! It has always been about color.. It all began when I joined an art class at the age of 9-years-old. On a whim, I selected painting and from that moment forward I fell in love with color. Bold reds, crystal blues and vibrant greens were just a few of the colors that graced my palette as I created one artwork after the next. I've engaged in several crafting mediums throughout my life including doll-making, drawing and ceramics to name only a few. However, in 2009 I rediscovered my love for knitting and yarn. One sunny morning, sitting in the middle of my garden something changed. I cannot really describe it but I can only say I went through a deep transformation while knitting. 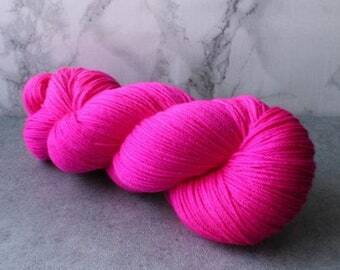 Just by seeing that bright and textured fuchsia yarn between my needles my artistic horizon expanded. It was like a gap in my creative endeavors was being filled. Right then, right at that moment my dream was born. After that day, what was only a leisure pursuit; it became a labor of love and fiber obsession. Now, I can say my work with natural fibers and yarn has proven to be the most rewarding and fulfilling. 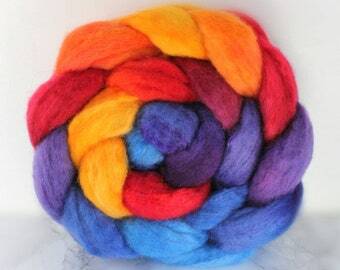 There is just something so magical about taking a pristine skein of natural fiber and flooding it with lively color. With the same passion that I took this path, with great pride I offer high quality hand-dyed yarns and fibers in a wide array of colors. 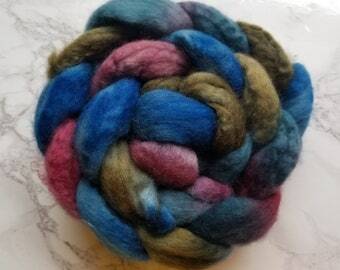 Inspired by the colors found in nature, I take pleasure in delivering vibrantly colored fibers and yarns to my customers. 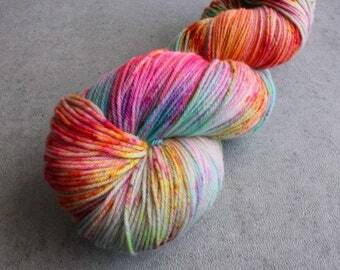 There is nothing I love more than creating gorgeous fibers and fresh colorways that will inspire you to knit and spin beautiful creations. Self-taught artist always experimenting with color. Favorite mediums are wool & canvas. I love playing with watercolors. While I don't believe in Mermaids, but like the idea of them being good fun girls. I <3 whimsy, odd & quirky things. Thanks for stopping by at my store. I am so glad you decided to shop with me. I hope you have a pleasant experience by getting one of my products. I just want to mention that all my items are carefully crafted with the best materials out there. My goal is to make beautiful items with the best supplies and offer them to you at a fair price. If you ever have a concern or a comment, feel free to contact me. I hope you like what you see and decide to take something to spin at home! In the event that your FIBER containing item is not what you expected in terms of quality, or shipping issues please contact me before shipping back and/or posting feedback. Returns will require approval and acknowledgement. Please, keep in mind that if you are returning an item, it has to come in the same condition as received and all items need to be accounted for with their original weight (including extras/gifts). No partial fiber is to be accepted for returns unless agreement has been made. Returns must be sent via traceable and insured parcel. I cannot be responsible for lost items in their way to me. (As a rule of thumb, sender is always liable for their shipments). I work on a case by case basis, but I will do my best to find a satisfactory solution to the situation. Thank you for your understanding. Payment is due at the time of purchase. Methods available are Paypal and Credit Card via Etsy. I do not accept personal checks or money orders. In the occasion that I agree on a custom order, a 25% non-refundable deposit is due before I start working on your order. If you are not happy with your custom item, I will release all obligation (minus the 25% deposit) to buy that particular item and will provide with a refund upon receiving the items in return (you are responsible for return shipping). Cancellations will be accepted while item has not been taken to the post office. Once items are shipped, a return can be approved via private communication. You will be responsible for return shipping (returns must be sent via traceable and insured parcel. ). Refund minus the cost of original shipping to you will be provided once item is return in integral* condition to me the seller. (*Integral: it has to come in the same condition as received and all items need to be accounted for with their original weight (including extras/gifts). No partial fiber is to be accepted for returns). If you are a resident of Arizona state, tax will be calculated automatically upon checkout. I use Etsy calculated shipping. All fibers have been weighted with packaging, paper, any extra goodies I may send. However, if at the time of shipping weight comes below resulting in a shipping rate lower than stated, I will refund any difference over $1 dollar. All items are guaranteed to go out within one business day after order is placed. If you placed your order on Friday, Saturday or Sunday, your items will ship Monday. (Guaranteed handling within 24 hours DOES NOT apply to Custom orders, unless agreed via private message). In the event that I go on Vacation, I will announce it. All items will go out in the mail before I put my store in vacation mode. However, if there is any issues with the shipment, please expect response upon my return. I regretfully say that I will no longer mark packages as "Gift" as this could potentially cause legal issues. Thank you for your understanding. At the moment I am not taking custom orders. Please keep checking back for any changes in the future!